An evergreen large shrub or small tree, with a rounded crown, short trunk and woolly new twigs. The tree can grow to 5-10 m tall, but is often smaller, about 3-4 m. The leaves are alternate, simple, 10-25 cm long, dark green, tough and leathery in texture, with a serrated margin, and densely velvety-hairy below with thick yellow-brown pubescence. The flowers are 2 cm diameter, white, with five petals, and produced in stiff panicles of three to ten flowers. The flowers have a sweet, heady aroma that can be smelled from a distance. Loquats are unusual among fruit trees in that the flowers appear in the autumn or early winter, and the fruits are ripe in late winter or early spring. Loquat fruits, growing in clusters, are oval, rounded or pear-shaped, 3-5 cm long, with a smooth or downy, yellow or orange, sometimes red-blushed skin. The succulent, tangy flesh is white, yellow or orange and sweet to subacid or acid, depending on the cultivar. 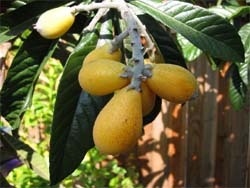 The Loquat is easy to grow and is often also grown as an ornamental tree.